Are you a deep dish kinda pizza fan? Do you prefer New York-style? Or are you more of a thick crust, nonna/Detroit-style? Oh my lord there are so many kinds and they’re all so good! How to choose your favorite? The thing is, this post isn’t a call to action…unless you want it to be. (And if so, please tweet us @thehungryfan and let us know your favorite kind of pizza and why). We aren’t asking you to choose. As October is indeed National Pizza Month, we thought we’d simply take this opportunity (granted to us by the gods of monthly food holidays) and celebrate one of our favorite game day (and basically every other day) foods, pizza. Where to begin? How about we take a virtual tour across the country, from east to west (much like the sun on its daily path of rising and setting) as we look at pizza across America. They say one of the things that makes imitating New York-style pizza outside of New York so difficult is that you need New York water to make proper and authentic New York pizza. There are pizzerias across America that actually import water in from New York to do just this. (Incidentally, it’s that same water that makes New York’s bagels so fantastic). What’s in the water? Experts say that it’s the minerals present in New York City’s tap water (which is known to be of excellent quality) that are what provide the pizza dough with its signature characteristic texture and flavor. New York, to borrow from The Daily Show’s Jon Stewart, is a bit of a pizza mecca. You’re got famous spots such as Lombardi’s (founded in 1905 by Gennaro Lombardi in Little Italy and is the oldest pizzeria in town), Grimaldi’s (try their first location under the Brooklyn Bridge), Joe’s (a West Village favorite and great for a [wide] slice), John’s (perfect if you enjoy a slightly charred charcoal-y bottom crust), Denino’s (on Staten Island), Totonno’s (famous Coney Island spot opened by former Lombardi’s employee Antonio Totonno Pero) and Arturo’s (just north of Lombardi’s on Houston Street). And don’t forget those newer neighborhood standouts such as Roberta’s (in Brooklyn), Nicoletta’s (in the East Village), Motorino (also in the East Village) and Bleeker Street Pizza (in the West Village). New York-style pizza, which originated in New York City in the early 1900s, evolved from Neapolitan-style pizza (from Naples, Italy). Historically, it was cooked in a coal-fired or coal-powered oven and its characteristics include a large, hand-tossed thin crust, which is crisp along the edge but still pliable enough beneath its toppings to be folded in half when eaten. (That’s how true New Yorkers eat their pizza. Just ask Jon Stewart when he explained this in this classic clip from The Daily Show that still cracks us up 7 years later). Traditional toppings for a New York pizza are a thin later of tomato sauce and dry, shredded, full-fat mozzarella. But NY definitely does pepperoni well, if you’re up for some spicy peps. The average New York pizza pie is 18 inches in diameter and is typically cut into 8 fantastically wide slices. Pizza by the slice is a staple in New York and it’s remarkably easy to find affordable slices, despite how pricy NYC can be. In fact, there are tons of $0.99 or $1.99 slice spots scattered throughout the city. And the pizza is actually good. New York-style pizza can be found in the New York Metropolitan Area, including in New York (state), Connecticut, New Jersey and throughout the U.S.
FANGATING™ TIP: Never eat New York pizza (especially if you’re in NYC) with a fork and knife. It’s just plain wrong. If the pizza is too hot to pick up, have some beer. And then pick it up, fold and eat at will. For starters, it’s pronounced “ah-beets” if you’re looking to sound like you know what you’re talking about. The name is derived from the Italian dialect belonging to the Neapolitan immigrants who first settled in the New Haven area of Connecticut. And for the record, a lot of wise foodies and many publications, including Thrillist and Eater, identify New Haven-style apizza as the best pizza in America. So no, the popularity of apizza isn’t just something ascribed to some tiny hamlet somewhere in Connecticut. This pizza is for reals legit on a national scale. What makes apizza, or New Haven-style pizza, so special? Certainly a few things from the water, to the dough’s long fermentation time to the coal-fired ovens in which they’re baked. Much like New York-style pizza’s relationship to the NYC water supply, New Haven’s water composition is important in the process of baking apizza. New Haven’s water is said to be moderately hard and slightly mineral-laden, which is apparently the most ideal type of water for making dough. What does this actually mean? This kind of water, which is the second-largest ingredient that goes into the dough (after flour), makes it easier for the dough to adhere to itself. This, in turn, yields a denser and crispier crust. Also noteworthy: Most New Haven pizzerias utilize a process in which they allow their dough to settle much longer in the fridge before they bring it to room temp, roll it out, add toppings and bake. The extra long resting period in the cold slows the yeast and makes it less sour. It also yields a more elastic dough. The story goes that apizza got its start in the early 1900s when Frank Pepe, an immigrant to New Haven from Maiori, Italy (about 60 kilometers or 37 miles south of Naples), set out to create a delivery service that sold “tomato pies”, which are a kind of pizza that’s made with a spongy dough and is topped with only tomato sauce, some oregano and a light sprinkling of pecorino romano cheese. Turns out the delivery business wasn’t that great. So in 1925, Frank founded the landmark Frank Pepe Pizzeria Napoletana on Wooster Street—the godfather to all New Haven-style pizzerias. From his pizzeria, he sold his tomatoes pies and eventually apizza as we know it today, with other cheeses including mozzarella. (Mozzarella is considered a topping in New Haven). 1938 saw the birth of one of the biggest food rivalries in New Haven, if not the U.S. or the world, when Frank’s nephew, Salvatore Consiglio, who had learned the craft of apizza making, went out on his own and opened Sally’s Apizza, which serves Neapolitan-style apizzas similar to Frank Pepe’s. The traditional characteristics of a New Haven-style apizza is that it’s baked in a coal-fired or coal-powered oven at a piping hot 650 degrees Fahrenheit or hotter and that it features a thin crust with a good deal of char, tangy tomato sauce and oftentimes, no cheese. (AKA a “Plain Pie”, Frank Pepe’s original delivery apizza item). The shape of the crust is often oblong, features a chewy texture and it tends to be drier and thinner than a New York-style pizza. That said, the two are very similar as they both trace back to the pizza of Naples. FANGATING™ TIP: If you make it to New Haven to try some apizza, be sure to head to Frank Pepe’s and try the white clam pie. He invented it and at Pepe’s you find it served with littleneck claims on the half shell—Frank used to only serve the clams at the bar. He later added them atop the apizza along with olive oil, oregano, grated cheese and chopped fresh garlic. And now we transition into a heartier, thicker crusted pizza, which originated in Detroit, Michigan. The difference between Detroit-style and pizza from New York, New Haven, or even Chicago (see below) is allllll in the crust. Detroit-style is extra thick, very crispy on the bottom and has a very chewy texture. The Detroit-style pizza reminds us quite a bit of the nonna pies, or grandma pies, of Italy. Grandma pies are made with a dough that is allowed to proof for a short period of time, if at all, which results in a soft, dense crust that’s low-ish to the pan and features an olive-oil-crisped bottom. (And yes, for your pizza connoisseurs, the nonna pie is different than the Sicilian-style crust. While both are stretched in a pan with olive oil, the Sicilian pie is allowed to proof considerably longer until it’s fluffy and domed, which yields a light, open and airy crust that’s somewhat similar to focaccia bread). Historians write that Detroit-style pizza dates back to a restaurant called Buddy’s Rendezvous, later renamed Buddy’s Pizza, in 1946. The story, which is a bit fuzzy, goes that the owner, Gus Guerra, was looking to shake up the menu of his struggling neighborhood bar at 6 Mile and Conant. He came to acquire a few unused blue steel industrial utility trays from a friend who worked at a factory. Seeing the trays, and despite their rectangular shape, Gus thought that they might good Sicilian-style pizza. Turns out he was right. Oiling the trays, Gus found that the dough became soaked through with the oil, which yielded a crispy, crunchy exterior crust and soft and airy interiors. And the cheese bubbled over and became caramelized—all thanks to the trays. Where the dough came from is a bit muddled. Some say Gus’ wife, Anna, got the recipe from her Sicilian mother. Others say an old Sicilian guy taught Gus how to make dough. No one knows for sure. What we all can agree on, however, is that Detroit-Style pizza is downright delicious. Traditionally, this style of pizza is served in a rectangle shape—the result of having many an industrial parts trays on hand in Motor City. Indeed, per Gus Guerra’s unique and resourceful pizza-baking technique, pizzas in Detroit are baked in a square pan, which is often not a pizza pan but some sort of industrial pan. These industrial pans were at one time was used to hold small parts in factories and are quite heavy—similar, in fact, to cast iron skillets. The crust of a Detroit-style pizza is thick and quite crisp, often the result of being twice-baked in a well-oiled pan. The pizza is baked until it’s got a a chewy, medium-well-done consistency and its bottom and edges feature a fried-like and crunch texture. (This is sometimes the result of certain pizzerias that apply melted butter to the crust with a soft brush prior to baking). Detroit-Style pizza is often served topped with goodies such as pepperoni and mushrooms. When it comes to Chicago’s deep dish-style pizza, we’ve learned there’s a trick to ordering and eating it. You’ve got to come hungry. But not so hungry that you’re already ready to chew your hand off. Absolutely not, no. Because making great deep dish pizza takes time. So when you order it, and they make it to order, you’re looking at a wait time of (usually) around 25-40 minutes. So arrive to your pizza joint of choice in a state of hunger wherein 25-40 minutes from sitting down is when you might chew off a digit. Chicagoans take a lot of pride in their pizzeria of choice and we’ve seen them squabble over which deep dish is best. Here are some of the standouts from those we’ve tried: Pizzeria Uno (which, yes, is a chain now and maybe isn’t the best you’ll taste, but it’s a Chi-Town institution and its own Rudy Malnati Sr. is credited with being one of the people who invented deep dish) or its sister pizzeria, Pizzeria Due (they have a great lunch special for solo eaters where you can get half a pie—which is still a ton to eat on one’s own); Lou Malnati’s (Lou got the family recipe for the crust from Mama Malnati and his dad, Rudy, as aforementioned, was one of the original deep dish pizzaioli—and the pizza is simple and delicious); Pizano’s (founded by Rudy Malnati’s son, Rudy Jr.—we dig this family); and Giordano’s (yes, another chain, but this is another founding father of deep dish with a recipe they claim dates back 200 years—and their pizza crust is flaky and delicious, almost like a pastry’s). According to Chicago’s official cultural historian, Tim Samuelson, there’s no one person who is officially credited with having invented Chicago-Style deep dish pizza. It is said the recipe was first conceived at Pizzeria Uno in 1945 by its founder, Ike Sewell. Others say that it was Uno’s aforementioned pizza chef, Rudy Malnati, Sr., who created it. History aside, what makes deep dish unique is—as its name certainly implies—is its deep (or high-edged) crust, which when filled with pizza ingredients such as chunky tomato sauce and copious amounts of melty, gooey cheese, begins to resemble more of a pie, or even a stuffed pizza, far more so than it resembles a flatbread (of Neapolitan fame). While the pie might appear to be a pure gut bomb (and don’t confuse what we’re saying, because it totally is), the crust itself is actually of only thin to medium thickness. Deep dish Chi-Town pizza is characteristically round as it is baked in a round, steel pan similar to one you might use to bake a cake or a pie. (Think springform pans). The pan is well oiled (à la Detroit style), which helps make the pizza easy to remove and which also gives the outside of the crust a fried effect. When you take a bite of a good deep dish pizza, you may notice that the crust tastes a bit sweet. That’s because in addition to using a run-of-the-mill (see what we did there?) wheat flour, some pizzerias use corn meal or semolina, which provide a sweeter—and more yellowish in color/tone—flavored crust. Another noteworthy characteristic of Chicago-Style deep dish pizza is that it usually appears upside down. Rather than having the sauce atop the dough, and then the cheese and toppings, deep dish is made with the cheese (often sliced mozz) melted onto the crust first. The cheese is then covered with toppings, such as pepperoni or sausage (which forms a nice patty-like layer) or veggies such as peppers, onions and mushrooms. Then comes the sauce, which is uncooked and is often made from canned, crushed tomatoes (which gives it a nice chunky texture) and sometimes a sprinkling of parmesan cheese. FANGATING™ TIP: If you’re getting your deep dish to go, ask them not to slice it for you. If you slice it, moisture from the sauce and the toppings will seep into the crust and the pie will take on a soggy texture. What a sad, sad thing to behold. Pittsburgh Style Pizza: A lactose-intolerant eater’s nightmare, Pittsburgh pizza is really no more than a vessel for cheese. In the Iron City, you’ll find a thick and puffy, doughy crust (not a great locale for celiacs), often with crispy and caramelized edges, topped with oodles of melty, gooey cheese. San Francisco-Style Pizza: Think CPK but better. Its creation is mostly ascribed to chef Ed LaDou, and the pizza chefs working for chef Alice Waters at her Chez Panisse restaurant in Berkeley, California. The style was then popularized and spread around the country by chef Wolfgang Puck. Quad City-Style Pizza: The Quad City region is a region of Iowa and Illinois and while you may not have heard of their pizza, it’s darn tasty. The crust is crispy and chewy (and a bit sweet due to molasses), it’s served cut into thin strips, features a sometimes spicy tomato sauce and toppings hidden underneath generous portions of mozzarella cheese. 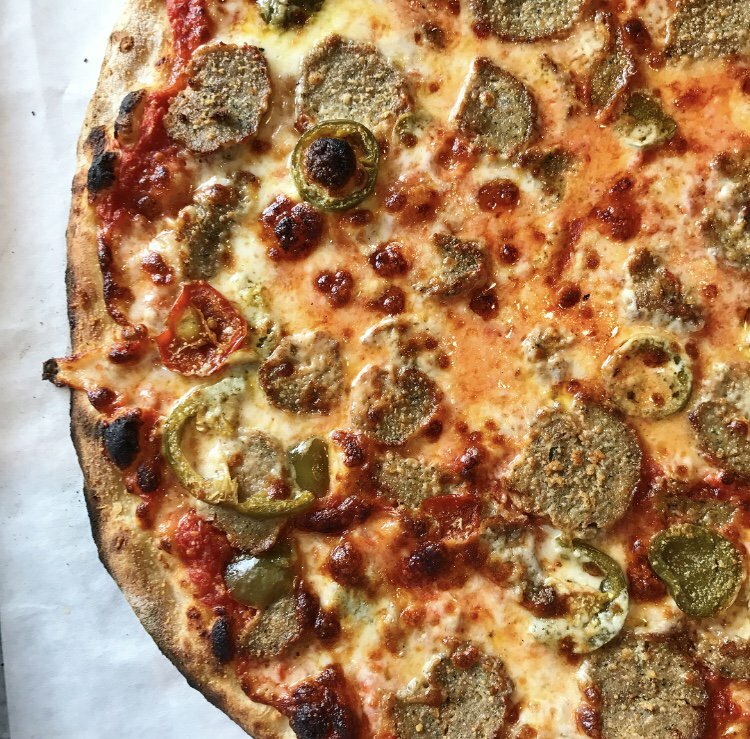 St. Louis-Style Pizza: It’s definitely unique. With an almost cracker-like crust devoid of yeast and a topping of processed cheese, it might feel like it should be paired with a charcuterie platter. New England’s Greek-Style Pizza: This pizza is baked in a shallow pan, instead of directly on the bricks on the bottom of the pizza oven (like true Neapolitan pizza) and instead of in a deeper pan like those used in Detroit or Chicago. Jumbo Slice (D.C. vs. NYC) Pizza: Apparently it’s a fight for who can serve the widest, largest slice of pizza. In DC’s Adams Morgan, where they’ve become quite popular, jumbo slices can be cut from a pie that measures up to 32 inches in diameter. Where does your favorite pizzeria stack up? Here’s a list of the Top 100 Highest Grossing (Independent) Pizzerias in America.